Apricot is grown in a wide range of climatic conditions in Iran, however, it is frequently damaged by late spring frost. In this case, identification of new genotypes tolerant to cold stress is indispensably needed. The objective of this study was to evaluate the genetic population and relationships among 27 apricot accessions (Prunus armeniaca) by 30 microsatellite markers and 11 morphological traits. Based on the PIC values, the SSR loci (UDP96001, UDP96003, UDP98412 and UDP98411) were the most informative markers. The morphological traits were categorized into three components which explained 91.23% of total variation. The two-dimensional PCA plot exhibited that the highest degree of fruit quality and quantity belonged to the susceptible cultivar of Shahrood 48 which showed to be the favorable parent for the production of resistant mutants with high value of fruit traits to late spring frost. Moreover, the close relatedness of Shahrood 48 and its mutants according to the molecular analyses (including a Bayesian clustering approach and a Partial repeated bisection) confirmed the results of fruit traits analysis. The findings suggest that the wide diversity present in Iranian apricot genotypes could be used as a genetic resource for conservation and development of new cultivars resistant to late spring frost and for designing further apricot breeding programs. The promising new mutant genotypes tolerant to cold stress will be evaluated based on morphological markers in further breeding studies. Akpinar, A., Kocal, H., Ergul, A., Kazan, K., selli, E., Bakir, M., Aslantas, S., Kaymak, S. and Saribas, R. 2010. SSR-based molecular analysis of economically important Turkish apricot cultivars. Genet Mol Res, 9:324-332. Aran, M., Fatahi, R. and Zamani, Z. 2012. 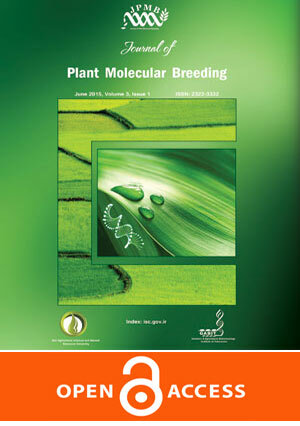 Molecular and morphological discrimination of selected plum seedlings for rootstock breeding. J Fruit Ornam Plant Res, 20:5-19. Arzani, K., Nejatian, M.A. and Karimzadeh, G. 2005. Apricot (Prunus armeniaca) pollen morphological characterisation through scanning electron microscopy, using multivariate analysis. New Zeal J Crop Hort Sci, 33:381-388. Asma, B.M. 2008. Determination of pollen viability, germination ratios and morphology of eight apricot genotypes. Afr J Biotechnol, 7:4296-4273. Asma, B.M. and Ozturk, K. 2005. Analysis of morphological, pomological and yield characteristics of some apricot germplasm in Turkey. Genet Resour Crop Ev, 52:305-313. Badenes, M.L., Martinez-Calvo, J. and Llacer, G. 1998. Analysis of apricot germplasm from the European ecogeographical group. Euphytica, 102:93-99. Caliskan, O., Bayazit, S. and Sumbul, A. 2012. Fruit quality and phytochemical attributes of some apricot (Prunus armeniaca L.) cultivars as affected by genotypes and seasons. Not Bot Horti Agrobot Cluj-Napoca, 40:284-294. Chalak, L., Chehade, A., Elbitar, A., Cosson, P., Zanetto, A., Dirlewanger, E. and Laigret, F. 2006. Morphological and molecular characterization of peach accessions (Prunus persica L.) cultivated in Lebanon. Lebanese Sci J, 7:23-31. Davarynejad, G.H., Szabo, Z., Vaci Felhosne, E., Kun, Z. and Nyeki, J. 1993. Anther and pollen grain characteristics of apricot cultivars. Acta Hort, 384:351-354. Doyle, J.J. 1987. A rapid DNA isolation procedure for small quantities of fresh leaf tissue. Phytochem bull, 19: 11-15. El Hamzaoui, A., Oukabli, A., and Moumni, M. 2014. Morphological and molecular diversity and genetic structure of Moroccan cultivated almond (Prunus dulcis Mill.) beside some foreign varieties. Plant Genet Resour, 12:308-316. Fathi, A., Ghareyazi, B., Haghnazari, A., Ghaffari, M.R., Pirseyedi, S.M., Kadkhodaei, S., Naghavi, M.R. and Mardi, M. 2008. Assessment of the genetic diversity of almond (Prunus dulcis) using microsatellite markers and morphological traits. Iranian J Biotechnol, 6:98-106. Ganopoulos, I.V., Kazantzis, K., Chatzicharisis, I., Karayiannis, I. and Tsaftaris, A.S. 2011. Genetic diversity, structure and fruit trait associations in Greek sweet cherry cultivars using microsatellite based (SSR/ISSR) and morpho-physiological markers. Euphytica, 181:237-251. Halasz, J., Pedryc, A., Ercisli, S., Yilmaz, K.U. and Hegedus, A. 2010. S-genotyping supports the genetic relationships between Turkish and Hungarian apricot germplasm. J Am Soc Hortic Sci, 135:410-417. Kadkhodaei, S., Shahnazari, M., Nekouei, N., Ghasemi, M., Etminani, H., Imani, A. and Ariff, A.B. 2011. A comparative study of morphological and molecular diversity analysis among cultivated almonds (Prunus dulcis). Aust J Crop Sci, 5:82-91. Khadivi-Khub, A., Zamani, Z. and Bouzari, N. 2008. Evaluation of genetic diversity in some Iranian and foreign sweet cherry cultivars by using RAPD molecular markers and morphological traits. Hortic Environ Biotechnol, 49:188-196. Krichen, L., Audergon, J.M. and Trifi-Farah, N. 2012. Relative efficiency of morphological characters and molecular markers in the establishment of an apricot core collection. Hereditas, 149:163-172. Krichen, L., Trifi-Farah, N., Marrakchi, M. and Audergon, J.M. 2010. Comparative analysis of Tunisian apricot accessions on morphological and molecular markers. Acta Hort, 862:173-178. Li, M., Zhao, Z. and Miao, X.J. 2013. Genetic variability of wild apricot (Prunus armeniaca L.) populations in the Ili Valley as revealed by ISSR markers. Genet Res Crop Ev, 60: 2293-2302. Liu, K. and Muse, S.V. 2005. PowerMarker: an integrated analysis environment for genetic marker analysis. Bioinformatics, 21:2128-2129. Maghuly, F., Fernandez, E.B., Ruthner, S., Pedryc, A. and Laimer, M. 2005. Microsatellite variability in apricots (Prunus armeniaca L.) reflects their geographic origin and breeding history. Tree Genet Genomes, 1:151-165. Malik, S.K., Chaudhury, R., Dhariwal, O.P. and Mir, S. 2010. Genetic diversity and traditional uses of wild apricot (Prunus armeniaca L.) in high-altitude north-western Himalayas of India. Plant Genet Resour, 8:249-257. Marchese, A., Tobutt, K., Raimondo, A., Motisi, A., Boskovic, R., Clarke, J. and Caruso, T. 2007. Morphological characteristics, microsatellite fingerprinting and determination of incompatibility genotypes of Sicilian sweet cherry cultivars. J Hortic Sci Biotechnol, 82:41–48. Milosevic, T., Milocevic, N., Glisic, I. and Krska, B. 2010. Characteristics of promising apricot (Prunus armeniaca L.) genetic resources in Central Serbia based on blossoming period and fruit quality. Hort Sci, 37:46-55. Mir, J. I., Ahmed, N., Rashid, R., Wani, S. H., Sheikh, M. A., Mir, H., ... & Shah, S. (2012). Genetic diversity analysis in apricot (Prunus armeniaca L.) germplasms using RAPD markers. Indian Journal of Biotechnology, 11(2), 187-190. Moghadam, E.G. and Mokhtarian, A. 2006. Delaying apricot (cv. Shahroudi) flower induction by growth regulators application. J Appl Sci, 6:266-269. Mratinic, E., Popovski, B., Milosevic, T. and Popovska, M. 2011. Analysis of morphological and pomological characteristics of apricot germplasm in FYR Macedonia. J Agr Sci Tech, 13:1121-1134. Pritchard, J.K., Stephens, M. and Donnelly, P. 2000. Inference of population structure using multilocus genotype data. Genetics, 155, 945-959. Rasmussen, M. and Karypis, G. 2004. gcluto: An interactive clustering, visualization, and analysis system. UMN-CS TR-04 21. Raji, R., Jannatizadeh, A., Fattahi, R., & Esfahlani, M. A. 2014. Investigation of variability of apricot (Prunus armeniaca L.) using morphological traits and microsatellite markers. Sci Hort, 176:225-231. Rodrigo, J., Herrero, M. and Hormaza, J.I. 2006. Morphological and physiological parameters related to flower quality in apricot. Acta Hort, 717:89-90. Ruiz, D. and Egea, J. 2008. Phenotypic diversity and relationships of fruit quality traits in apricot (Prunus armeniaca L.) germplasm. Euphytica, 163:143-158. Sorkheh, K., Shiran, B., Gradziel, T.M., Epperson, B.K., Martinez-Gomez, P. and Asadi, E. 2007. Amplified fragment length polymorphism as a tool for molecular characterization of almond germplasm: genetic diversity among cultivated genotypes and related wild species of almond, and its relationships with agronomic traits. Euphytica, 156:327-344. Sorkheh, K., Shiran, B., Rouhi, V., Asadi, E., Jahanbazi, H., Moradi, H., Gradziel, T.M. and Martأnez-Gomez, P. 2009. Phenotypic diversity within native Iranian almond (Prunus spp.) species and their breeding potential. Genet Resour Crop Ev, 56:947-961. Viti, R., Bartolini, S. and Minnocci, A. 2000. Morphological structure of the stigma and style of several genotypes of Prunus armeniaca L. Plant Biosyst, 134:45-51. Wang, Z., Kang, M., Liu, H., Gao, J., Zhang, Z., Li, Y., Wu, R. and Pang, X. 2014a. High level genetic diversity and complex population structure of Siberian apricot (Prunus sibirica L.) in China as revealed by nuclear SSR markers. PloS one, 9:e87381. Wang, Z., Liu, H., Liu, J., Li, Y., Wu, R. and Pang, X. 2014b. Mining new microsatellite markers for Siberian apricot (Prunus sibirica L.) from SSR-enriched genomic library. Sci Hort, 166:65-69. Yeh, F.C. 1997. Population genetic analysis of co-dominant and dominant markers and quantitative traits. Belg J Bot, 129:157. Yilmaz, K.U. and Kargi, S.P. 2010. A new morphological trait for apricot characterization. Acta hort, 862:83-84. Yilmaz, K.U., Paydas-Kargi, S., Dogan, Y. and Kafkas, S. 2012. Genetic diversity analysis based on ISSR, RAPD and SSR among Turkish apricot germplasms in Iran Caucasian eco-geographical group. Sci Hort, 138:138-143. Zeinalabedini, M., Sohrabi, S., Nikoumanesh, K., Imani, A. and Mardi, M. 2012. Phenotypic and molecular variability and genetic structure of Iranian almond cultivars. Plant Syst Evol, 298:1917-1929. Zhebentyayeva, T., Reighard, G., Gorina, V. and Abbott, A. 2003. Simple sequence repeat (SSR) analysis for assessment of genetic variability in apricot germplasm. Theor Appl Genet, 106:435-444.